A recent hagiography of Kim Jong-un hails the tubby North Korean leader as a "gift from heaven" in an apparent push to complete his deification now that he has cemented power at home. Kim's newly consolidated status also became evident at last week's meetings of the Workers Party Central Committee, which he chaired alone for the first time, and the rubber-stamp Supreme People's Assembly. The official [North] Korean Central News Agency also first used the title "supreme commander of the armed forces" when Kim visited the Kumsusan Palace of the Sun on Monday to mark nation founder Kim Il-sung's birthday. It is a subtle switch from "supreme commander of the Korean People's Army," but to boffins it makes all the difference. "We are keeping a close eye on whether his title has changed completely," an excited government source here said. "If it has been replaced, we believe Kim Jong-un's stature has been strengthened." State media went into overdrive and apostrophized him as "supreme leader" of North Korea as well as "supreme representative of the people." 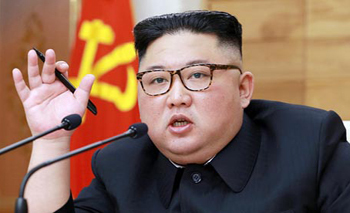 The biography, titled "Kim Jong-un, a Great Man," describes the leader as being "unusually bold and courageous at a young age and possessing a heroic and manly character and disposition, proficient in all things," and possessed of "insightful foreknowledge and scientific analytical capabilities." It describes the podgy 30-something as an adept equestrian, fearless boatswain and aggressive tank driver who "tightly grips the control stick and pushes the steel horse like storm and gale." In short, his "boldness and audacity cannot be matched by any mortal." Then the biographer runs out of terrestrial metaphors and concludes that he is simply a "gift from heaven" who is "perfect and entrancing." Earlier propaganda described Kim as an expert marksman from the ripe age of three who "demolished 10 targets one second apart, wrote poetry in Chinese characters and mastered seven languages." Then again, nation founder Kim Il-sung was able to "make hand grenades out of pine cones and created rice from sand," according to earlier screeds, as well as "capable of folding space and crossed a river on a dry leaf." His son Kim Jong-il's birth was also marked by disruptions in the space-time continuum when "216 swallows flew into the air on Feb. 16, even though it was winter." Yet only last month Kim Jong-un told officials that "mystifying the revolutionary achievements and appearance of the leader causes the truth to be hidden." Meanwhile, the hagiography quotes Kim as telling the Workers Party Central Committee in April last year that the doctrine of pursuing nuclear arms and economic growth in tandem had been "radiantly achieved." It claimed that Kim defended the country with nuclear weapons that placed North Korea "among the ranks of the world's military powers and ordered all efforts to be focused on economic development."